I have a love-hate relationship with the first week BACK TO SCHOOL - it's great to see my fabulous co-workers, catch up with friends, and see students back in my classes. However, it's also a frenzy of paperwork and "administrivia" that can bog us all down as we try to start off a new school year. It is so important that I get to know my students at the start of the year and I try to establish a connection with them quickly. Instead of the usual survey questions for Back to School, I've made things a little quirky and different. 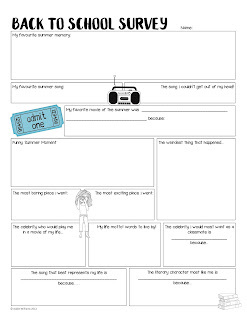 For example, I've asked students to list the song that got stuck in their heads the most this summer (for me it was "Greenlight" by Lorde... just goes 'round and 'round my head sometimes!!) Or to list their favorite flavor of ice-cream (Ben & Jerry's Phish Phood - chocolate caramel goodness!). 1. Be sure to do the survey yourself. For real. And be willing to share your answers with your students. 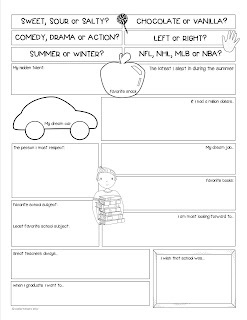 Students love to learn the little details about you and it can be a fun way to find a connection with a quiet or shy student. Plus... once my students figure out I love Skittles... it's amazing how often they bring me some. 2. Don't try to do the whole survey all at once. I usually ask the students to work up to a certain point and then stop. I take a few minutes to see if anyone wants to share an answer and then I share one of mine. This gives students who may feel "stuck" a chance to hear what others have said and it shows my students that I'm willing to share too. 3. After about 10-15 minutes of doing the survey I ask my students to stop again. I ask them to put a star or circle their favorite question on the survey that they've answered so far. I ask them to share with a partner. I give the students 2-3 minutes to do this. I ask for volunteers to share their answers... BUT I ask them to share someone else's answer. For example - "Juan's favorite movie this summer was ____________". Or... "Kira went to New York City for her vacation." And of course, I'll volunteer another answer. OR ask the students to pick a question for me to answer. 4. One of the questions I ask on my Student Survey is to name "the song that got stuck in your head this summer". Yup... you guessed it... I'll ask my students to write their answers on a sticky note and put it on the board so that I can play the songs during the first few weeks. Note - MY STUDENTS LOVE THIS! 5. I like to give my students lots of time to answer the survey - sometimes I'll leave it for a day and go back to it. The first few days of school can be overwhelming for some kids and often on their second opportunity to answer the questions they're more willing to expand on ideas. 7. Using sticky notes have students share their answer to a specific question using sticky notes on my board, (I don't ask them to put their names on their sticky notes.) and then I look for patterns or commonalities within the classroom. For example - "Wow... it looks like many of you saw 'Wonder Woman' this summer!" It's a great springboard to a class discussion! 8. As an extension idea I ask students to write a paragraph to justify one of their answers to a question of their choice. They pick the question and then they must write a correctly formatted paragraph to explain their answer - I get to know them a little more, but more importantly I can quickly identify what the strengths and weaknesses are in my classroom in terms of paragraph writing. 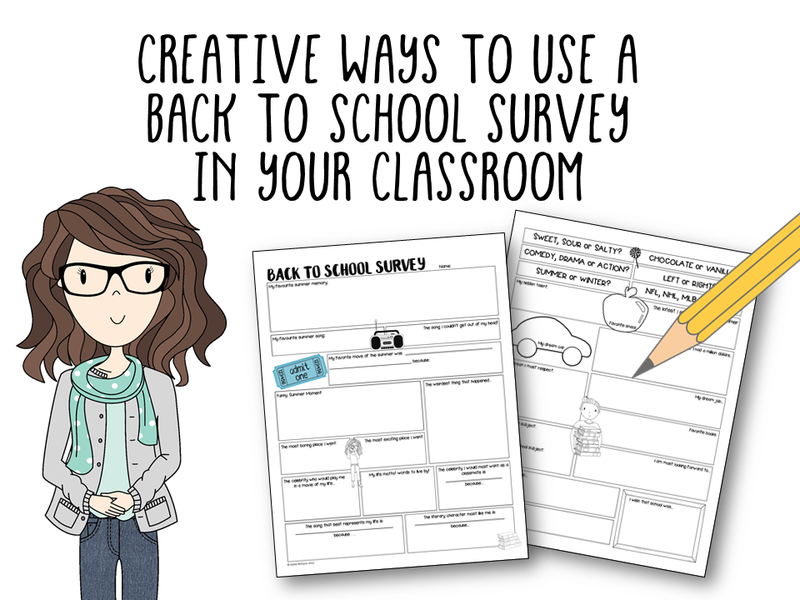 Download a FREE copy of my Back to School Survey from my TpT Store! 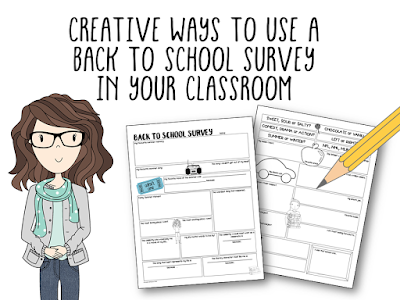 Download includes teacher activity suggestions, survey and writing paper. That is new and different! I needed something new. I always survey the kids, but I'm tired of the surveys I use. Something else I do is as hand out questions for them to ask me, so that we can get to know each other better. Thanks Joan... I like to fill out the survey with the students and share my answers too! Thank you - cute ideas! Thank you for sharing this! Looks way fun!